We all know the type. That friend who loves everything outdoors but still balks at the thought of sleeping under the stars with nothing more than a sheet of nylon offering protection from things that go bump in the night. Fortunately, for those outdoor lovers who still prefer boutique hotels to nights in the backcountry, there is a happy compromise—glamping. I, too, have one of these friends, a reluctant camper. So when I wanted to convince this tent-averse buddy to tag along for an entire weekend of hiking, biking, and paddling, I had an idea. I proposed the ultimate getaway, an excursion offering the scenery, serenity, and simple pleasure of a camping trip, yet with some of the trappings of a hotel by taking a glamping trip to Philpott Lake. Spreading into Franklin, Henry, and Patrick counties in southwest Virginia, Philpott Lake is a Blue Ridge jewel. Created in 1953 when the Army Corps of Engineers completed the Philpott Dam, the 2,880-acre lake turns 65 this year. Providing both flood control and hydroelectric power, Philpott Lake has also emerged as one of Virginia’s most stunning recreation destinations. Although the lake is man-made, formed by the damming of the mighty Smith River, the landscape surrounding the lake has been left wild. Nearly 20,000 acres of protected federal and state lands surround Philpott Lake, including state parks, recreation areas, and vast hardwood forests. Even better, Philpott Lake remains an under-the-radar gem, largely undiscovered by the legions of weekend warriors who regularly descend on neighboring Smith Mountain Lake. Car campers can bring all their modern trappings—string lights, lounge chairs, pancake griddles, and safari-worthy tents—and seek out an idyllic waterside campsite at one of four different recreation areas on Philpott Lake. For fat-tire riders eager to plan a multi-sport weekend, there’s the Jamison Mill Park. Spread over the northeastern corner of Philpott Lake, the recreation area offers six miles of singletrack for mountain bikers, plus paddling access to the lake, so it’s easy to go from wheels to water. Meanwhile, families craving a few lazy lake days can unwind at the amenity-loaded campgrounds at Salthouse Branch and Horseshoe Point parks, both offering kid-friendly beaches and plenty of leafy picnic spots. For wildlife lovers, there’s Goose Point Park. Tucked along the western edge of Philpott Lake, the park’s serene, pine-shaded campsites are regularly frequented by belted kingfishers trolling the shoreline. Don’t want to leave anything behind? Drive that fully stocked RV to Philpott Lake and take advantage of a camper sites edging the water. Big-rig drivers worried about space can cruise into one of the sizeable spots at Salthouse Branch Park (water and electric available). Spend a day casting for the lake’s largemouth bass and illustrious walleye, knowing you have a full kitchen available for that evening’s freshly caught dinner. Drivers of smaller rigs have even more options at Philpott Lake. Set up an adventure base camp at one of the water- and electric-equipped sites at Goose Point, Horseshoe Point, or Jamison Mill Park, and take advantage of the extensive trail network surrounding the lake. The newly minted Philpott Lake Blueway provides paddlers 25 miles of water trails to explore, and it is accessible from the nine different boat launches surrounding the lake. For runners and hikers, the Dogwood Glen Trail meanders through the mixed hardwood forests fringing Philpott Lake for 4.5 miles, running from Salthouse Branch Park to the Philpott Dam. Don’t want to skimp on comfort? 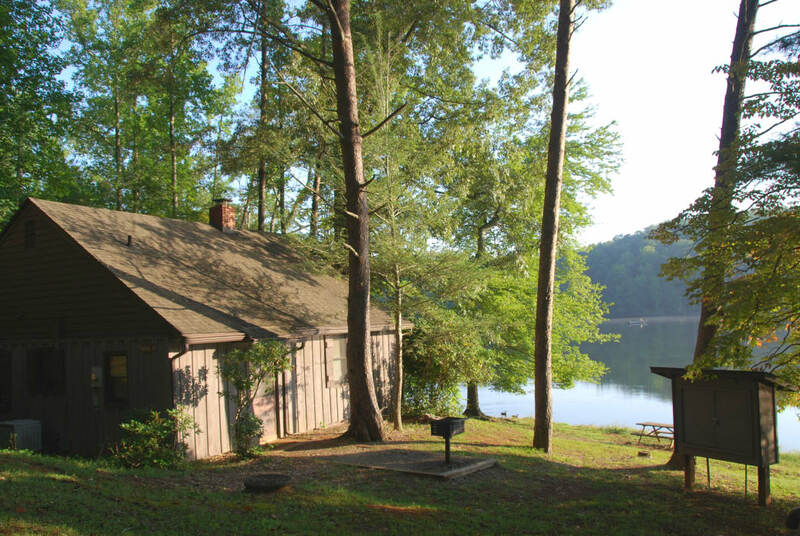 Head to Fairy Stone State Park, located on the western edge of Philpott Lake. Named for the tiny, staurolite crystals found hidden in the foothills of the Blue Ridge, dubbed “Fairy Stones,” the park offers some of the coziest options for glampers headed to Philpott Lake. Centered around 168-acre Fairy Stone Lake, the park features four ruggedly chic yurts, each framed by wooden decks, and all offering picnic tables and fire grates for grilling. For glampers who like the idea of a yurt, but like electricity and running water even more, the park also has more than two dozen cabins, some tucked right along the shores of Philpott Lake. 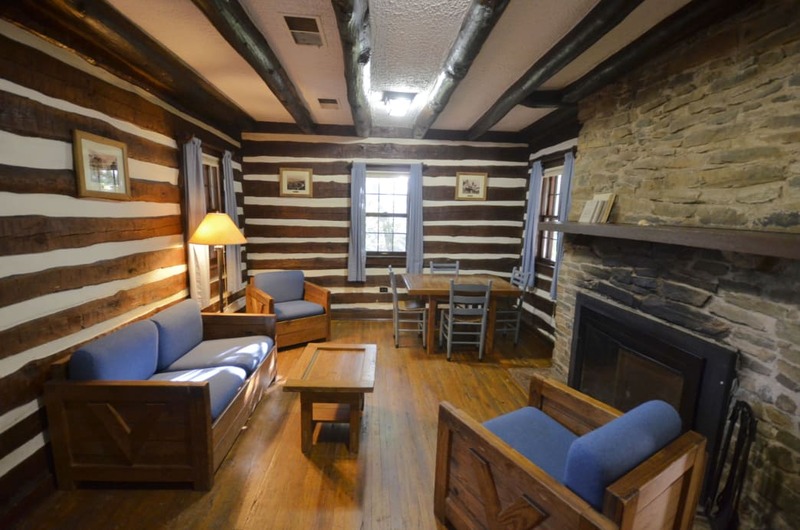 All of the dog-friendly cabins offer modern amenities like refrigerators, coffee makers, and fireplaces. For larger groups, the Fairy Stone Lodge is equipped with five bedrooms and sleeps 16 guests. In the end, it was easy to convince my buddy to spend a weekend glamping at Philpott Lake. With everything from hiking and biking to fishing and paddling, there is more than enough to fill a weekend with outdoor adventure. The most difficult part about planning a glamping trip to Philpott Lake is the wait—we don’t leave for another three weeks! Written by Michael Welch for RootsRated Media in partnership with Visit Franklin County VA.